It rained most of the day today. 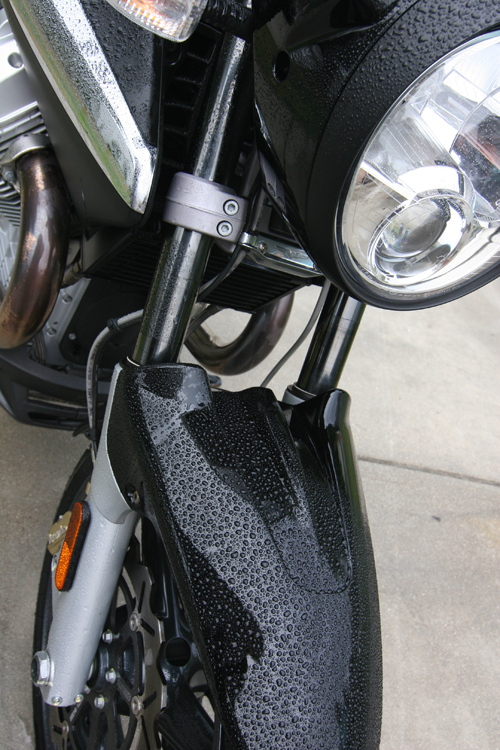 I took some pictures of the bike with the rain beads on it. Previous journalist riders had ridden the bike much harder than me, and had overheated the rear tire. 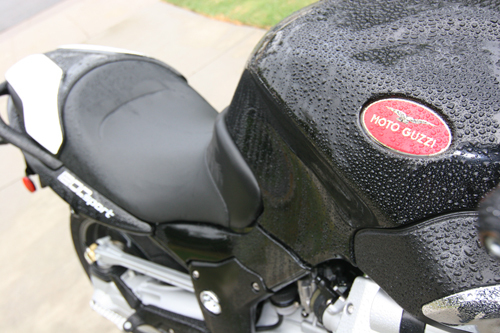 This became more apparent as it tried to lock as I rode it around a bit during a let-up in the weather. Didn’t last long, as I got stuck at my favorite Italian Deli (San Carlo in Chatsworth), sipping doppios and chatting with Giovanni, who owned a Guzzi Cardelino in Rome as a kid. Moto Guzzi Breva 1200 Sport, click for larger picture. Moto Guzzi Breva 1200 Sport detail, click for larger picture. So I stayed inside most of the day, nursing a cough. It’s going to be good weather tomorrow. 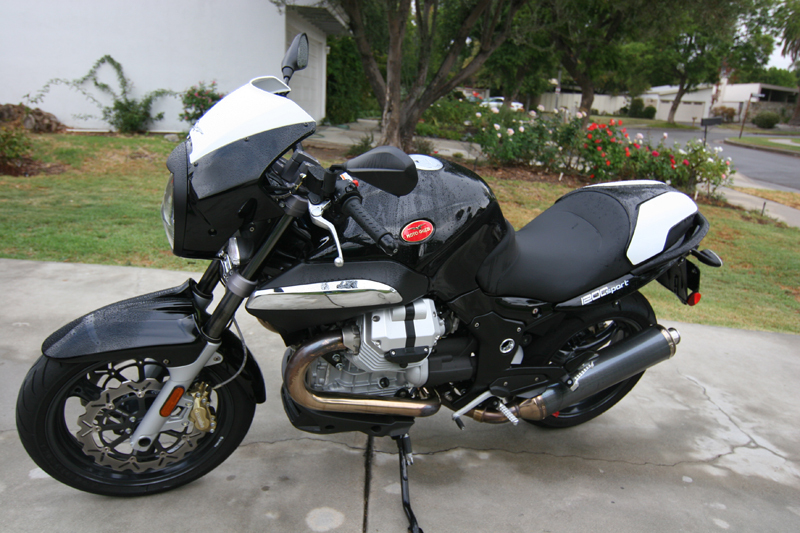 This entry was posted in bike reviews, Choosing a motorcycle, Motorcycles and tagged Breva 1200 Review, Breva 1200 Sport, Breva Pictures, Moto Guzzi Review. Bookmark the permalink. 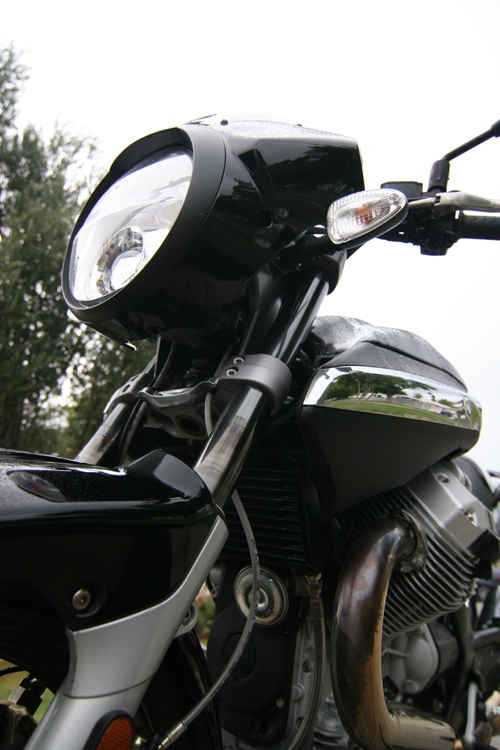 ← Moto Guzzi Breva 1200 Sport. A Bike for "The Most Interesting Man in the World"